The Minister of Education, Youth and Sports Hon. Patrick Faber launched his two-week countrywide tour beginning in San Pedro Town under the theme "Celebrating Education." The tour was launched on Thursday May 10th at the Angel Nunez Auditorium and is the first of a series of Town Hall type meeting with education stakeholders which will take place in all district towns. The main purpose of the tour is for the Minister of Education to meet with the education stakeholders and the community and share with them what the Government of Belize (GOB) is doing in the area of education. It also serves as a means for the Minister to listen to the concerns of the education stakeholders and the community and to see the areas that need attention in order to improve the quality of education in the country. In his address to the attendees, Minister Faber explained that 26% of the annual National Budget is allocated for education. Such investment surpasses by far the amount other countries in the region invest; an estimated six to eight percent. But in investing so much, Minister Faber explained that there is no "quality for value." He stated, "We have been investing so much but do not get the best from such investment. It clearly shows the inefficiency in the education system and it will take everyone to fix it." He went on to say that in order to get quality for value, "everyone must be on board with the Strategic Plan." In acknowledging the "tough issues" within the education system on the island, Faber added that "education is everyone's business and as such we need to get the entire community to help address the issues affecting the island. We need to get the business community, the Mayor, the Area Representative, we need to get the entire island involved if we want to see some of these issues addressed." Faber's comments came following issues raised such as the lack of class room space on the island; the hardship teachers face such as high cost of living, cost of housing; petition for benefits that would offset some of the expenses on the island, feasibility and lack of proper teacher’s training for island teachers that will improve the quality of education. In speaking to The SP Sun, Minister Faber explained that "over the past few years, we have made tremendous strides to address some of these issues in San Pedro. We have a strong presence with the hiring of a full time education officer and an assistant… we have been able to work more closely with many of the schools in terms of providing more opportunities… we have been able to graduate one cohort of teachers who have been trained through the Primary Certificate Program." Despite not have the "none traditional stakeholders in education" such as the business sector, Minister Faber called the town meeting a "good start" to get "the ball rolling" in addressing and solving some of the educational issues that plaque the community. 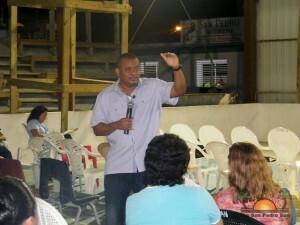 Minister Faber said that while the Ministry and GOB cannot solve all the problems affecting the island, he is prepared to meet with the local leaders as well as the private and business sector to come up with a plan that will address the many issues the teachers and the community face in the education system. As such, a property has been secured where GOB is hoping to build a government school which should alleviate the congestion in classrooms as well as provide access to many children currently not in school due to the lack of space. Faber said that it is now the task of the Area Representative Hon. 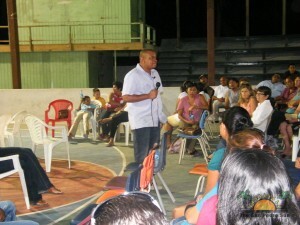 Manuel Heredia JR and the Ministry of Education to come up with ways to secure funds for such project. Faber said that he is hoping to engage the business and private sector in San Pedro to help with such initiative. "Because of the economic position of San Pedro, we hope that something can be done to engage the business sector, to ask them to support the education system out here," said Faber. 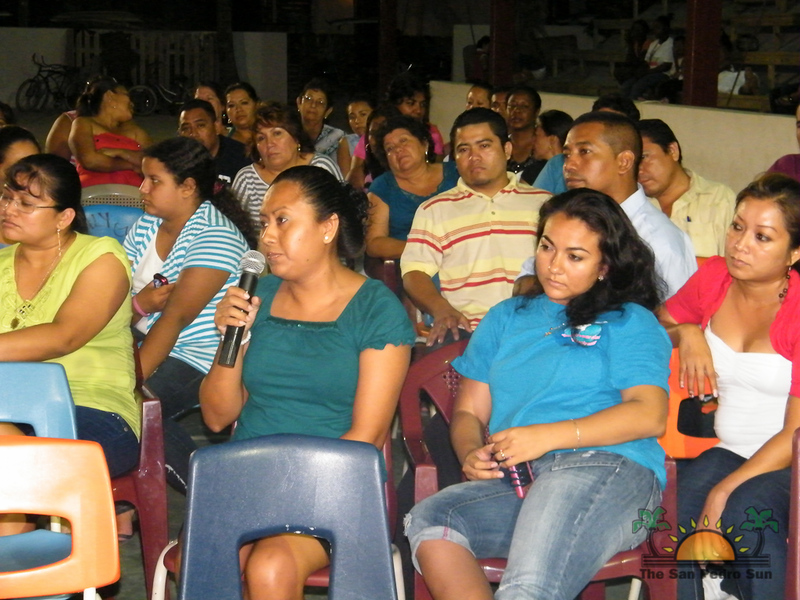 One such concept thrown out at the meeting by the education stakeholders is to ask the tourism stakeholders on the island to encourage their guests to make a voluntary $1 contribution for each night stayed that would go directly to the education system on the island. While Faber embraced such idea, he indicated that it would take "political will" and support from the Minister of Tourism and the local leaders to regulate a system that would monitor how monies are collected and how it will be used. "Clearly, if you want to get the business sector involved, you must be able to ensure community that you are willing to improve the quality of education," said Minister Faber. At the end of the meeting, Minister Faber encouraged the teachers to take a closer look at the new Education Strategic Plan, support the initiatives of the Ministry of Education and to take advantage of the many opportunities that are in place for them to improve. He also promised to look into some of the isolated issues affecting the island in terms of education and to work along with the Area Representative to alleviate them. The countrywide tour by the Minister of Education will conclude on May 18th.